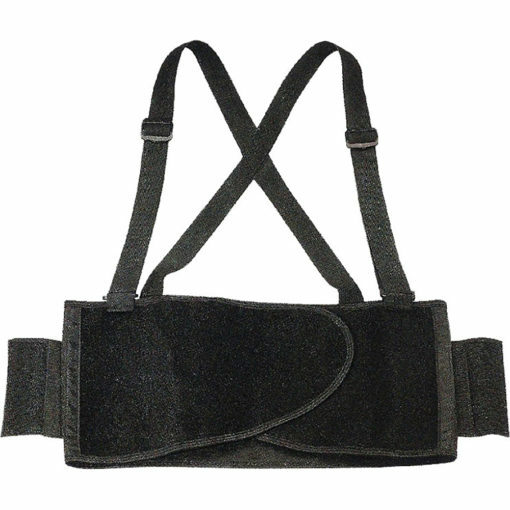 TG02613M | Back Support Belt Tuff TRADE Gear – Industrial Style Back Support provides comfortable relief from lower back discomfort. Size: Medium 100cm / 39inch Features  Easy Closure  Elastic Side Pulls  Excellent Support  Provides Stability Benefits  Smooth glide adjustable clips.  Tapered abdominal support panels.  Easy adjust elastic outer panels for added lower back support.  1-1/4 extra wide support elastic suspenders.  Fully enclosed spring steel stays for flexible contoured support.